Reviews what different template publishing options mean and how to change them. When you're working to set up and launch a new process on CityGrows, sometimes you go through a few versions or drafts before you are ready to use that process with the public. What do you do with older drafts? What if the application period for a particular program or service has closed, but you still want to keep the open data information visible on what's already happened visible to the public? 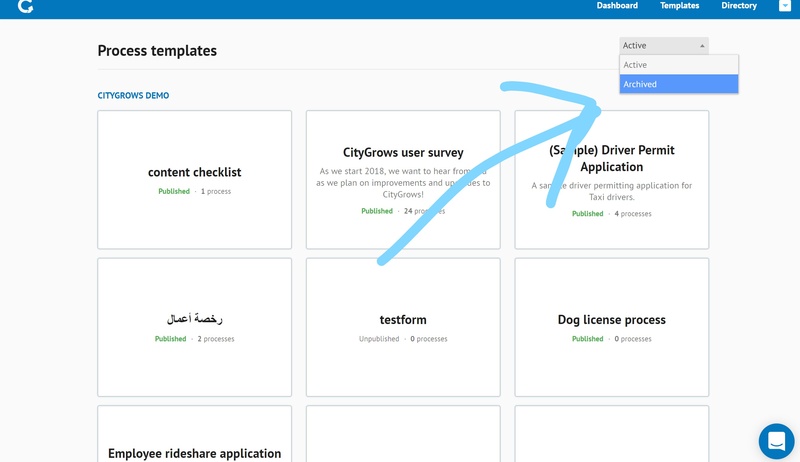 Here's a review of the template status options you can select from on CityGrows. All of these options can be accessed (after you hit the green "Publish" button the first time on your draft) from the top of the Edit screen for each template. Published: This means the template is accessible on your Public Portal page, and is usable by the public. Unpublished: Use this if you want to keep editing a template, but don't want it visible to the public yet. It will still be visible to any admins you've added via the Permissions tab or any Reviewers you've added for testing. Closed: This keeps the template visible on your Public Portal, but new submissions aren't accepted and it shows on the portal with a "Closed" tag. The open data from previous submissions remains visible. Here's how two Closed and one Active process appear on the City of Monrovia's portal page. Archived: If you're pretty sure you don't want to access or view an old template (an unused draft or something you've decided not to use) then consider archiving it. It will disappear from your Templates page and won't clutter up your view. However if you need to access it, you can select "Archived" templates from the dropdown at the upper right of your templates page. Here's hoping these options keep your Templates page clear and functional!